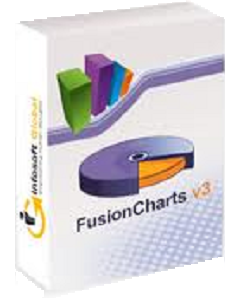 FusionCharts - FusionCharts, FusionWidgets, FusionMaps, PowerCharts Hong Kong/Asia Distributor, Reseller | Cogito Solutions Ltd.
FusionCharts v3 helps you create animated & interactive charts for web & enterprise applications. It is the industry's leading enterprise-grade charting component that functions seamlessly on PCs, Macs, iPads, iPhones and a majority of other mobile devices. FusionWidgets v3 helps you present your KPIs in dashboards, real-time monitors and financial reports concisely and beautifully. It offers a wide variety of gauges and charts including dial charts, linear gauges, Gantt charts, funnel & pyramid charts, bullet graphs and sparklines. The widgets take in data in XML and can be integrated with any server - side technology (ASP, ASP.NET, PHP, JSP, ColdFusion, Ruby on Rails etc.) and database. The live streaming capabilities of FusionWidgets with auto-update feature ensures that your charts always show current data updated to the second. FusionMaps help you create animated, interactive and data-driven Flash Maps for your dynamic web applications. Using FusionMaps, you can display geographical data distributed by category, regions or entities. Ideal usage examples are statistical display of data, flight routes, office locations, election results, survey results or business data like "Revenue by Regions" or "Revenue by states". The maps are driven by XML data source and can be integrated with any server-side technology (ASP, ASP.NET, PHP, JSP, ColdFusion, Ruby on Rails etc.) and database. FusionMaps offers over 500 maps including all continents, major countries and all US states. PowerCharts is a set of advanced charting widgets for specialized applications like network diagrams, financial planning, simulation, hierarchical structures and stock prices. It offers highly interactive capabilities like visual editing of data, drag & drop arrangement of data nodes and switching & changing of axis limits. The widgets take in data in XML and can be integrated with any server-side technology (ASP, ASP.NET, PHP, JSP, ColdFusion, Ruby on Rails etc.) and database. Many of the charts are first-of-its-kind on the web, letting you add Rich Internet Application functionality with ease. What our users say about FusionCharts? FusionCharts has greatly enhanced our use of GoldMine Corporate Edition. The combined use of GMviews and FusionCharts gives the capability of creating a custom GoldMine dashboard. It opens the eyes of our customers.